Most powerful blowers are gas, which also means they are heavy and bulky. But, the Dewalt Cordless Electric Brushless Blower runs off a 20-volt battery, so it’s lightweight and easy to control. It uses an innovative axial fan design that maximizes on air output and run time and provides up to 90 mph of air speed. 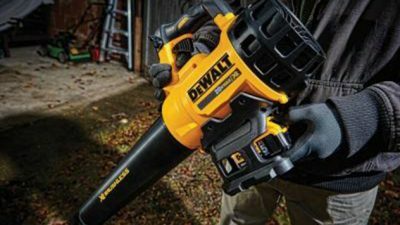 It is a little more expensive than other blowers on the market, but if you need a lot of power, the Dewalt is a great choice. Includes 5-hour battery back and charger.